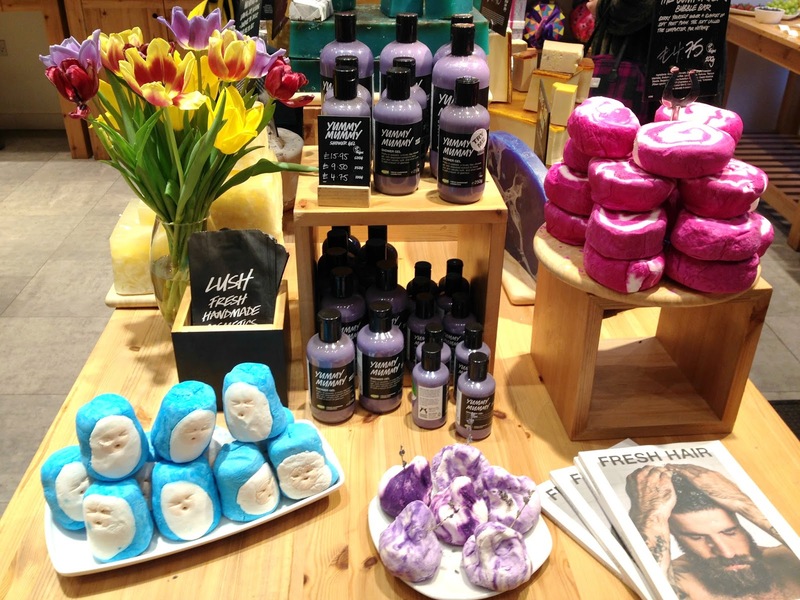 Lush does the best holiday themed products and Mother's Day and Easter are no exception. I was kindly invited to preview some of the latest releases at my local store in Chester last Sunday, there was a small group of bloggers, which made the event feel very intimate. The event kick started with a demonstration on their famous massage bars, I'd bought a Hottie massage bar previously but wasn't entirely sure how to best use it, so it ended up in my shower unloved. The lovely Kii showed us the various types of bar, described the different ingredients and scents. We had a fun little ice breaker game, where we got to use the massage bars on a fellow bloggers arm. It was very strange at first, massaging someone I didn't know but soon me and blogger Beth, were laughing away and I felt more comfortable. I picked up a few tips on the best ways to use the massage bars. 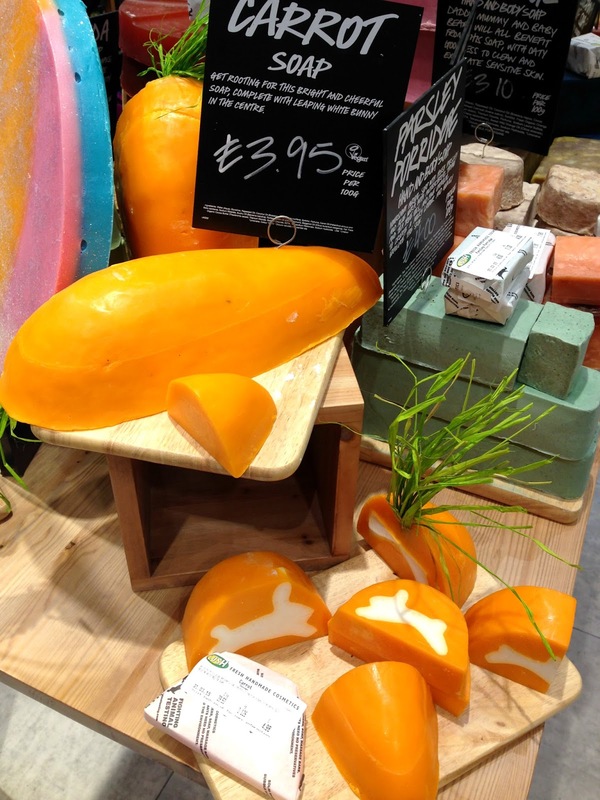 The ladies from Lush recommend you warm the bar up in your hands and then rub the bar across the arms in a few swipes. This coats both your hands and your partner's arms. Then you should use slight pressure as you move and massage upwards and use a more gentle touch on the stroke down. You can also massage the fingers and the wrist bones for further relaxation. A light dust from their body powders finished off the skin and left us feeling as soft as a baby's bum. 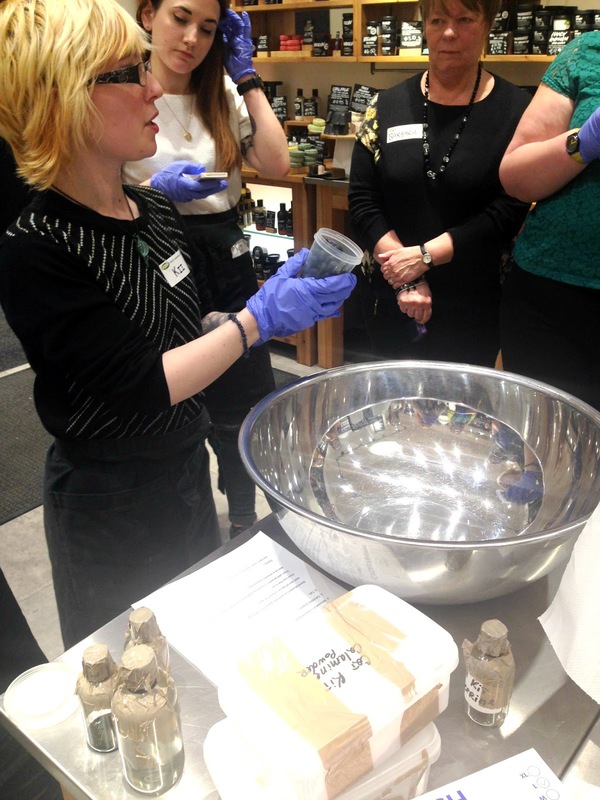 After this relaxing arm massage, we were ready to see the demonstrations of the new bath bombs and soaps. Large bowls and jugs with warm water were set up and then the fun began. Mother Superior, which looks like Mother Theresa to me, is a little cute bubble bar. All of them after handmade so they are all pulling different strange faces. 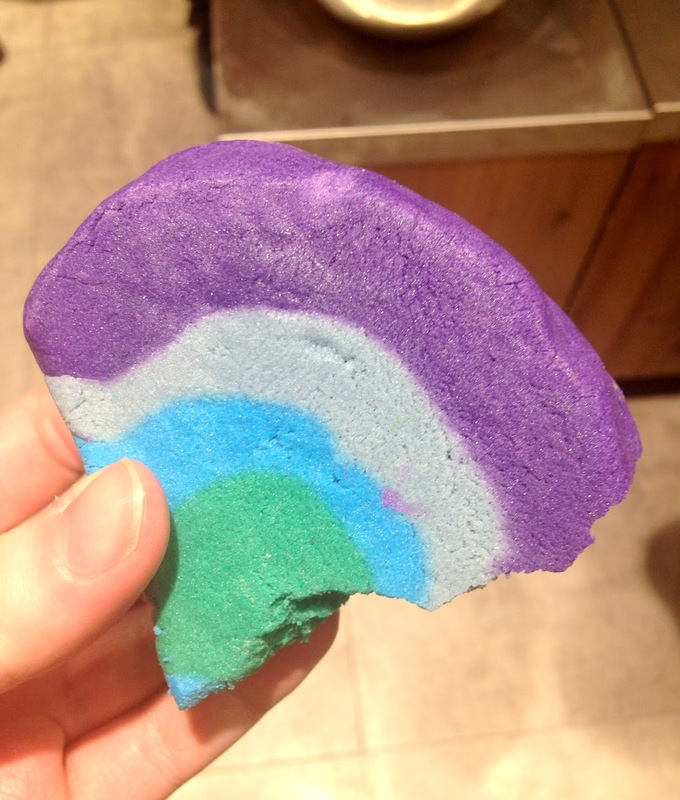 This bubble bar can be used 3-4 times if you can face cutting her up. The fragrance has notes of Sicilian Lemon Oil, Mimosa, Jasmine and Orange Blossom, the best way to describe the scent is a calming floral. Rose Bubble Bar looks like the Comforter, in that it has the same pink swirls but this number has a touch of shimmer. As the name suggests this bubble bar has a wonderful rose scent, I know most Mother's love rose scents, so this one is a fail safe option. The ingredients alongside Rose are Cocoa Butter and Rose Hip Oil, so it's very soft and moisturising on the skin. 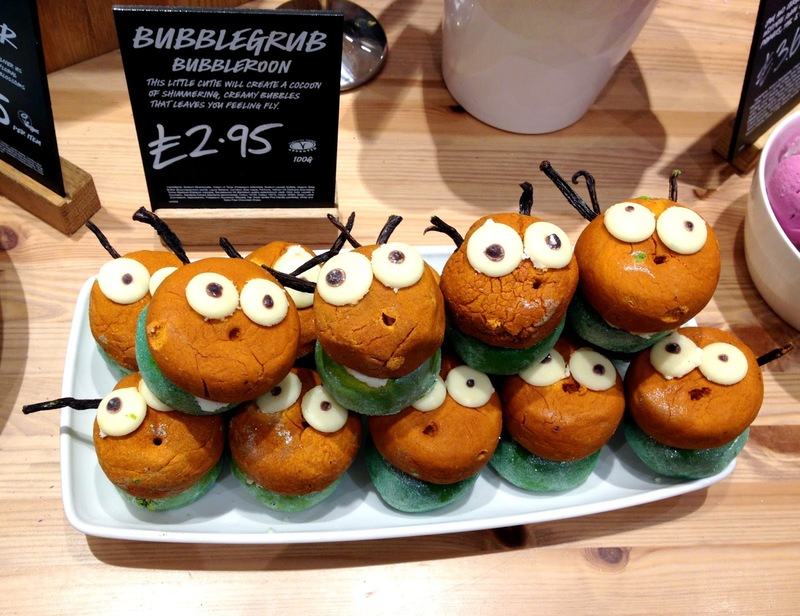 Based on the Hungry Caterpillar, Bubblegrub Bubble Bar is one of the stars of the show. It's tiny little face just makes you go 'awwhhh'. If you don't mind squishing this cutie between your fingers to crumble into the bath, you'll experience aromas of Sandalwood Oil, Vetivert Oil, Tonka and Shea Butter, it's quite an earthy scent and again, this bubble bar very moisturising. 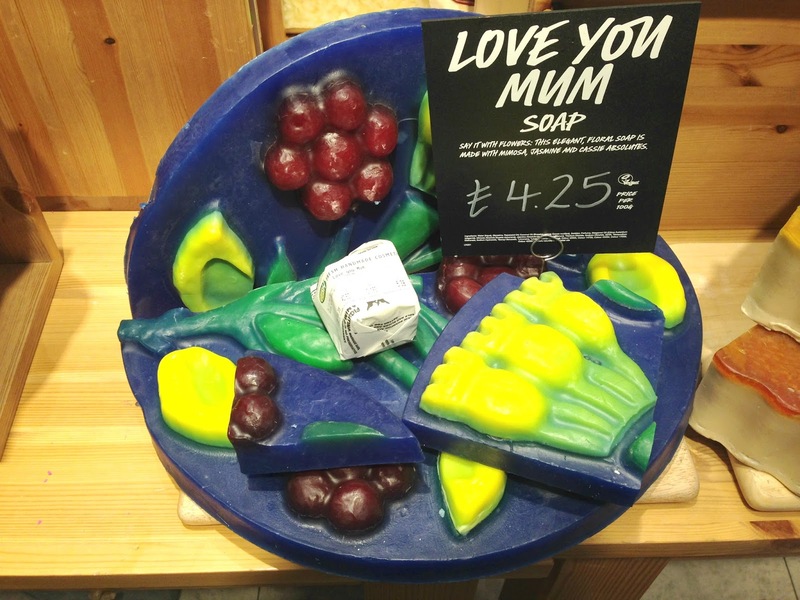 Ultraviolet has to be my favourite of the Mother's Day collection; it's a purple, blue and green rainbow, which can be used for 3-4 baths. Matching their Violet perfume, the ingredients are Violet Leaf, Jasmine, Ylang Ylang Oil and Rosewood Oil, it's quite a hypnotic scent. I just love the vibrant purple water that it creates, as well as the big glossy bubbles. 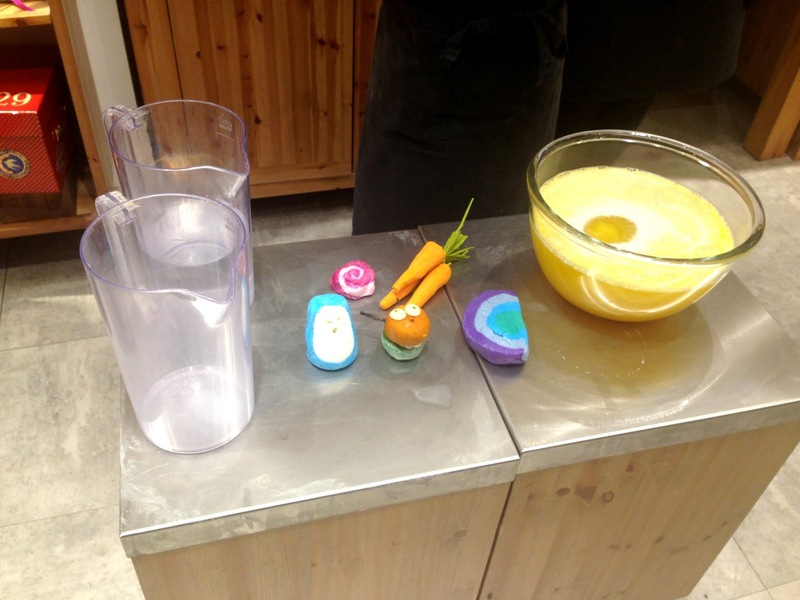 We also had a preview of two of the Easter bath bombs and bubble bars, the Golden Egg and Bunch of Carrots. 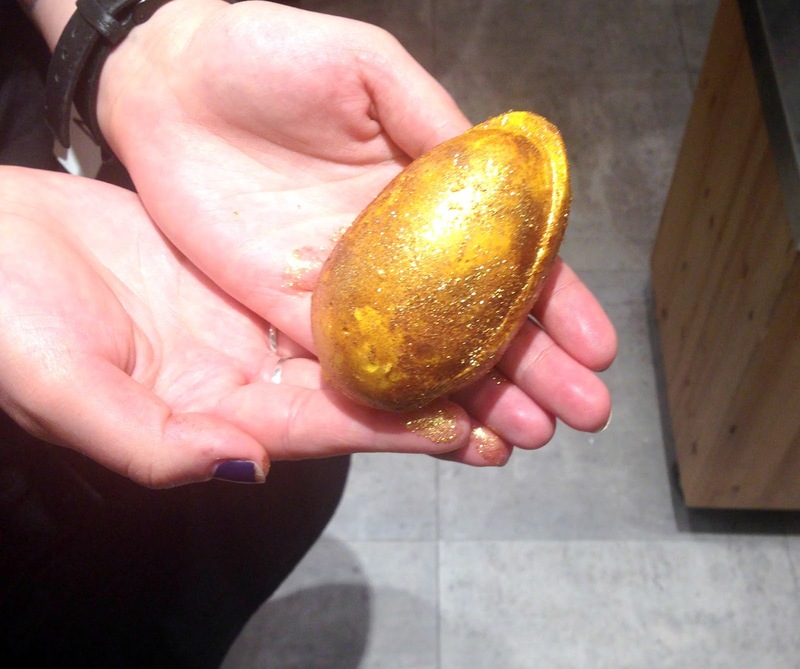 The Golden Egg has a wonderful gold glitter, this washes away to reveal a fizzy bath bomb and under that is a chunk of cocoa butter, which melts to moisturise your skin. Did you know that Lush don't use plastic glitter? They use natural materials so that it's more kind on the environment and water table. The egg smelt of Wild Orange, Bergamot and Cocoa Butter and it fizzed away for ages, worth a buy in my eyes! 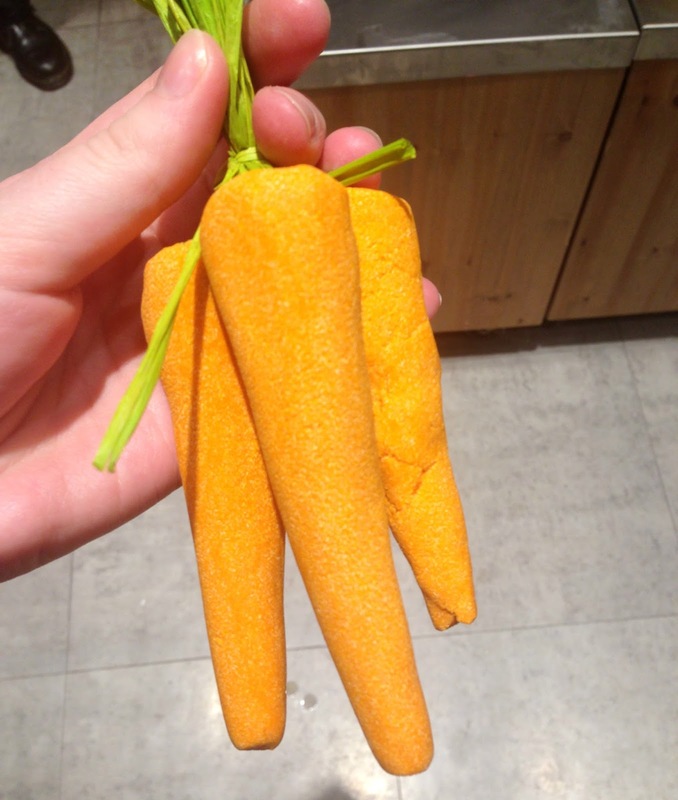 The Bunch of Carrots are such a cute novelty item, you just run these under the tap, like you would with the Magic Wand, which came out at Christmas, and these should last you a few baths. They had a wonderful scent of Lemon and Bergamot, very fresh and uplifting. We were also shown some of the themed soaps. 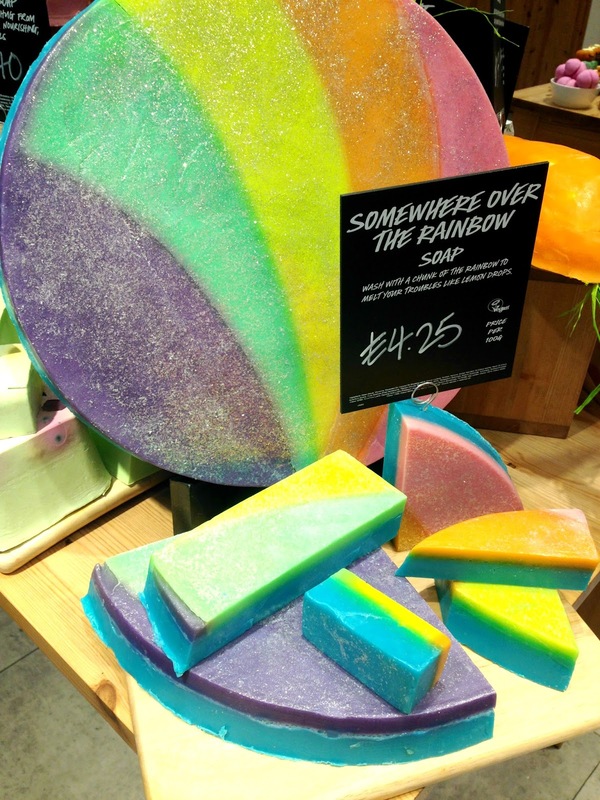 The Love You Mum, the Carrot Soap and Somewhere Over the Rainbow soaps are beautifully designed. 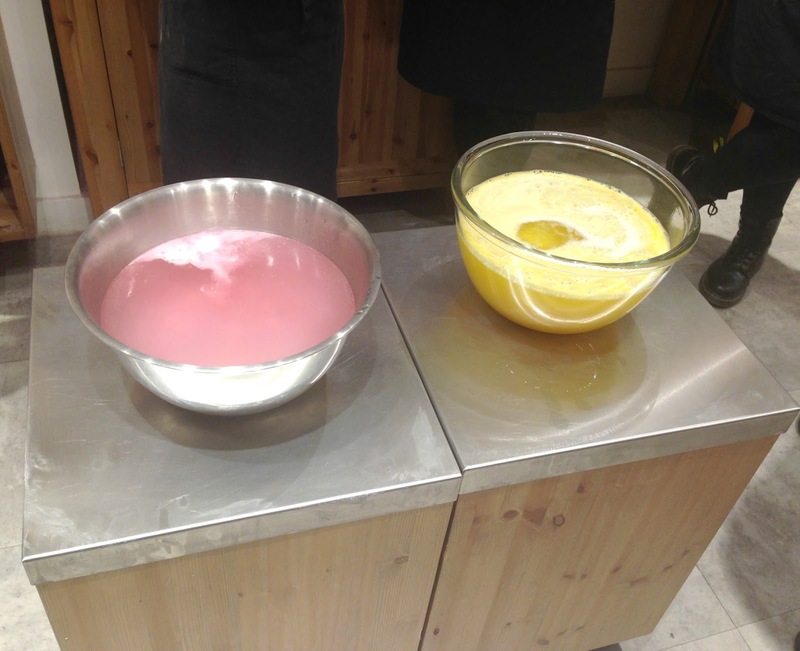 I asked how they created the layers and colours in the large soaps; apparently they fill the moulds with the coloured ascents first, let it set and then pour the backing on a few hours later, just like you would with coloured jelly. Normally, us bloggers don't like to get messy, but we will make the sacrifice for a face mask ;) We donned rubber gloves to create the Catastrophe Cosmetic mask from scratch. Squishing blueberries into the mix was strangely therapeutic. We all got stuck in and the staff allowed us to take a pot of the mask we'd made home to try. I'd like to thank the Chester Lush staff, they were amazingly friendly and knew their stuff. 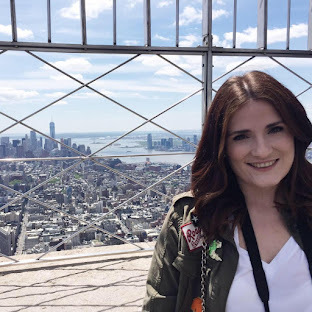 I met some lovely bloggers too and I can't wait to see their posts! I love lush things, thanks for the lovely giveaway. I love Lush and spend way too much in there. Oh what a fab giveaway. I always walk past lush and breathe in the smell lol. Love it. I put the wrong name in the box for following on pinterest - I put wilcox25 and it should have been mwilcox25 but can't reopen it to change it, sorry! 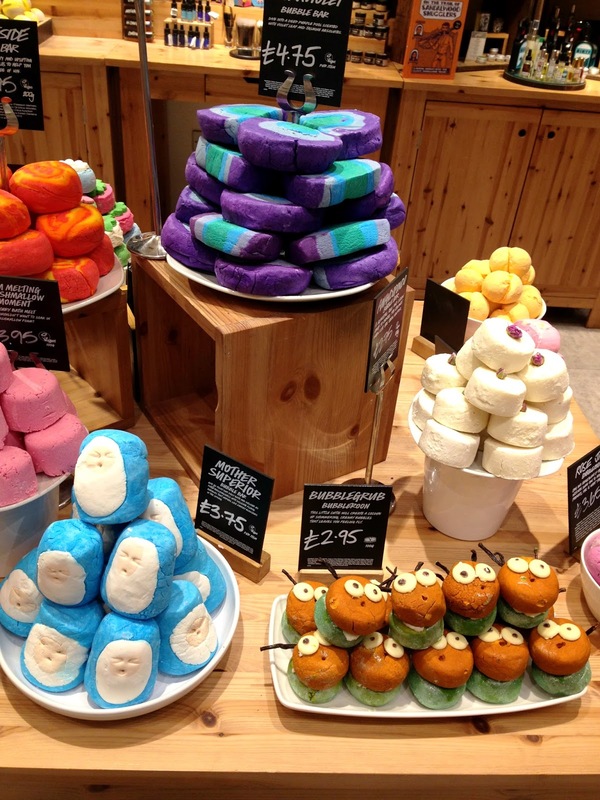 Wish I was in the UK, Lush products look amazing.